Many hobbyists and retailers encourage beginners to decide up front whether they want to set up a reef tank or a fish only tank. Most choose a fish only tank because a reef is intimidating. This is actually a poor time to make such a decision. There is no reason to commit to either end at the beginning. This plan is designed to enable a novice to set up an aquarium that will begin as a fish only tank but can easily be converted to a reef tank. Buy the tank, stand and canopy. Obviously, the rest of the equipment does no good without these. Based on the filtration system you want to set up, you could choose a normal fish tank, tank with a back panel filtration system, or with a built-in overflow box. I would strongly encourage you to get a tank with a built-in overflow, basically a corner box with holes in the bottom for connecting to a sump tank (usually hidden inside the stand, under the display tank). A sump is nothing more than a container that holds water and is connected to the main or display tank. In addition to increasing the system capacity (and therefore creating a bigger margin for more stable conditions), a sump is a good place for all filtration equipment and heaters, chillers, monitors and probes, where they can perform their functions without cluttering the look of the tank. Many beginners shy away from anything that takes water out of the tank for fear of leaks. They want all hang-on-the-back equipment. Then they realize later they would really like a sump under the tank to take all the equipment out of view (it provides other major benefits too), so they install one using a hang-on overflow box. 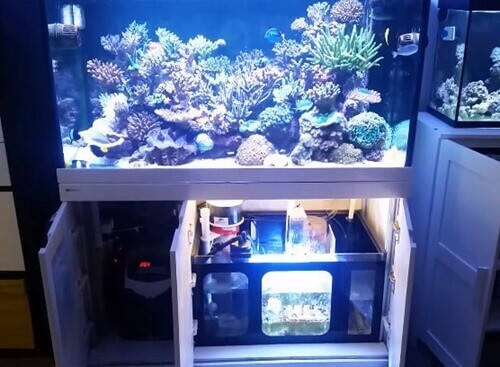 If having condition, you should get an aquarium with built in overflow that will benefit so much for a long run. As for size, go with the biggest tank you can afford and fit in your allotted space. The larger tank you choose the easier it is to maintain a stable water environment for the healthy fish and corals. 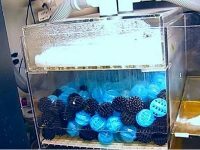 Ensure that the aquarium you choose larger than 20 gallons, a 50-55 gallon aquarium is the best to get started to the saltwater aquarium hobby for a beginner. As for shape, a lower tank with more surface area is better than a tall tank. I’d also suggest a tank with a colored background (black or blue). Stick to standard sized and shaped rectangle tanks as it can be difficult to find lighting to fit custom tanks, especially those with odd shapes. Choose a large enough location with level and well supported surface for your aquarium and stand. 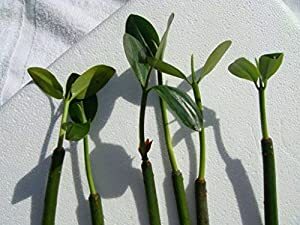 Make sure to leave enough space for electrical connections and other equipment as well as space around the aquarium for aquarium care and maintenance. The tank should not be placed near a heat source or in a location where it will get too cold (like a drafty window in a cold climate). Placing the tank near an air-conditioning source is generally okay as long as you have a large enough heater to assure no temperature drops. Ideally, you should select a location that will help in maintaining a constant temperature between 76 and 80 degrees. Perhaps most importantly, do not place an aquarium where it will receive direct sunlight. Doing so is a sure recipe for algae and heat problems. Previous is an example of the most simple but complete sump filtration system for a saltwater reef system. The mechanism of this system is so very easy to understand. The water pump pumps water from the sump to the tank, overflow water goes into the overflow box and back to the sump – a simple loop. The sump is a good place for all filtration equipment and heaters, chillers, monitors and probes, where they can perform their functions without cluttering the look of the tank. You will need to plumb the sump with the tank as well as other equipment (if use) and make sure there is no water leak. When the plumbing is done, use a little water to test for leaks and rinse everything. Then remove the water. The mechanical filtration component is usually placed under the water hose connecting the sump with the display tank. This could be filter socks or a box containing floss, foams, or other mechanical filter media. These materials capture solid particles floating in the aquarium water for manual removal. If you do not build in a mechanical filter in your sump design, consider adding one to the setup. There are many inexpensive hang-on power filters like the Aquaclear series. Cannister filters full of mechanical and chemical media also work well. The middle compartment of the sump is a great place to accommodate live rock, algae and saltwater plants for performing multi types of filtration. 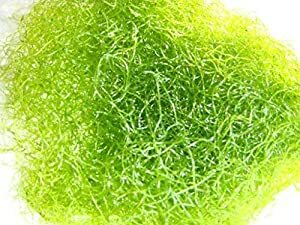 While live rock deals with ammonia and nitrites (biological filtration), macro algae and saltwater plants use nitrate and phosphate for growth, and there by reducing these chemical substances (chemical filtration). 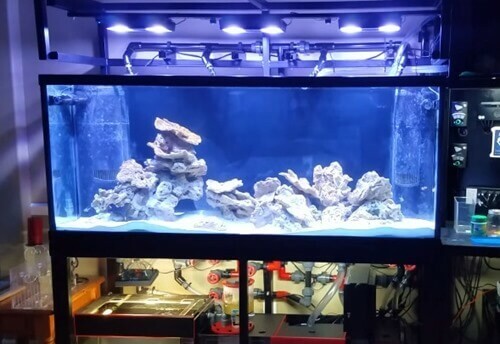 A suitable aquarium LED light should be installed to maintain the life of these. 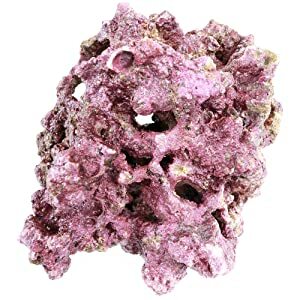 Live rock is the best biological filter you will ever buy for a saltwater aquarium. Live rock are placed in the display tank and/or sump. In sufficient quantities, live rock can eliminate ammonia and nitrites (while keeping nitrates low) better than the most expensive wet/dry filter, fluidized sand bed or other man-made contraption. With enough live rock, you will have no need for any of these pricey and fallible devices. 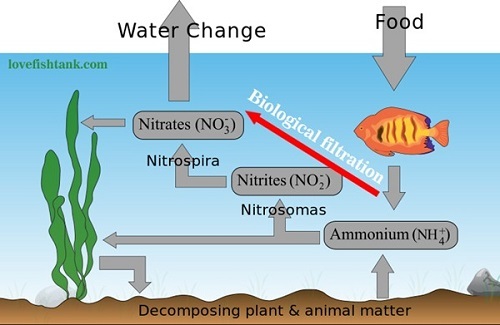 Although live rock is excellent at converting ammonia to nitrites to nitrates, but in a heavily stocked system, high levels of nitrates can build up, beyond what can be controlled by regular water changes. Unless you want a tank overrun with algae and inhospitable to corals, you need a way to export nitrates. Besides, saltwater organisms, especially delicate reef organisms, have a much lower tolerance for nitrates than freshwater fish do. Macro algae and saltwater plants are great additions to keep nitrate levels low. A great protein skimmer is the most important piece of equipment you will buy. Do not skimp here. 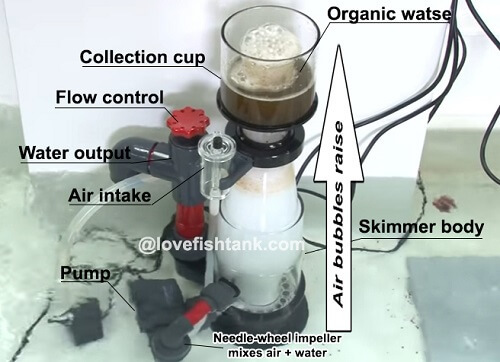 A protein skimmer (or foam fractionator) mixes a column of aquarium water and air that results in fine air bubbles. The surface tension of the air bubbles attracts dissolved organic material and carries it to the surface of this column in a layer of foam. As this layer of dirty (an understatement) foam builds, it pushes its way into a collection cup where you can empty it. The protein skimmer is your first line of defense. It pulls from the water the organic matter that otherwise would dissolve into ammonia and eventually pollute your tank. 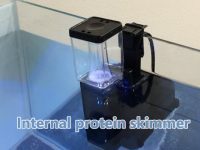 If you have the opportunity to view a good protein skimmer in action, you will be amazed at the amount of foam it produces and the amount of gunk (skimmate) it pulls from the water. Imagine dumping that gunk back into the tank you work hard to setup and maintain and you will understand why this piece of equipment is so revered among hobbyists. A protein skimmer is powered by its internal pump that uses water directly from the sump and doesn’t require plumbing. 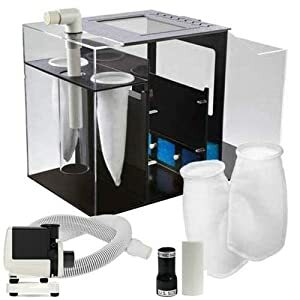 This makes it very easy to choose any skimmer you want provided that it fits the sump as well as the space you place it. You cannot operate your sump without a return pump. It is the pump that returns water from the sump to the main tank. As it fills the tank, the water level in the tank rises and water flows into the overflow box and back to the sump, where it is filtered and returned to the tank. While opinions on flow rates vary, marine systems seem to do best if the flow of water between tank and sump turns over the tank volume at least ten and up to twenty times per hour. This means a 100 gallon tank should have a flow rate of 1000-2000 gallons per hour. Many demanding corals even require much higher turnover rates of 30X, 40X, 50X! Higher rates reduce algae, improve fish health, open corals and make for a healthier tank all around. Consider the fact that wild specimens are accustomed to water flows and surges that would turn over your tank volume many times per second. As long as your overflow and plumbing is wide enough to accommodate the flow, it is hard to conceive of a marine tank that could have too high a flow rate. In selecting a pump, keep in mind that pumps lose flow rate as pressure increases. Pressure increases as return plumbing gets smaller or the trip back to the tank gets longer. Bends and turns in return plumbing also reduce flow rates. This is all known as head pressure. In a typical under-the tank setup with ¾” or 1″ return plumbing, assume a head pressure of four or five feet. Check the flow rating for any potential pump (most manufacturers list this information on the box) and select a pump that will turn over your tank volume ten to twenty times per hour at that head pressure. Substrate is the substance that will go in the bottom of the tank – the sand, crushed coral or other base of the ecosystem. Aragonite and oolite are good choices. You can choose between live sand or dry sand. 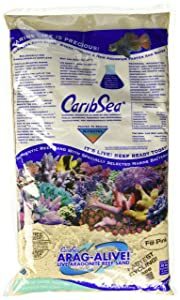 I recommend live sand because it contains live microorganisms that help to fasten the nitrogen cycle in your saltwater reef system. You will need about one pound of substrate per gallon of tank capacity to fill a 1″ bed, and 2 lbs/gallon for 2″ bed. As for rock, It is economical to use both live rock and fry rock because live rock is so expensive. Place live rock surround fry rock for it to get lighting for the life activities and creating a natural appearance. The live rock can be cured or uncured but cured would be better. Buy it online where the deals and quality are better. 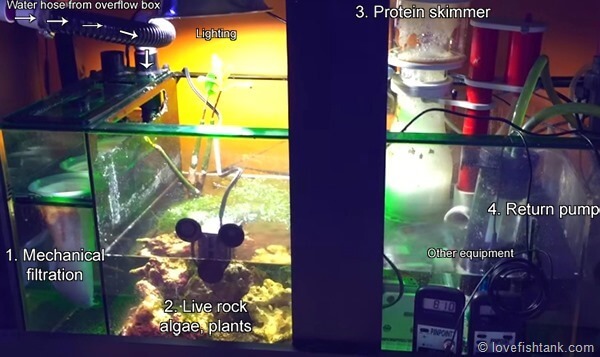 The rule-of-thumb is 1.5 to 2 pounds of live rock per gallon of tank capacity. Buckets – You should keep on hand a few buckets that are new and have never been used for anything other than water. Five gallon buckets are handy for aquarium tasks like acclimating new arrivals, rinsing substrate, moving dripping rocks and equipment, water changes, and other miscellaneous tasks. It also is a good idea to buy a new 30 gallon plastic garbage can for mixing new saltwater. Water source – Many hobbyists would recommend purified water from a reverse-osmosis water filter (R/O unit) on the priority list. That’s not bad advice and will allow you to start off with pure water. If you are unsure what is in your tap and have no access to inexpensive purified water, this is a must. 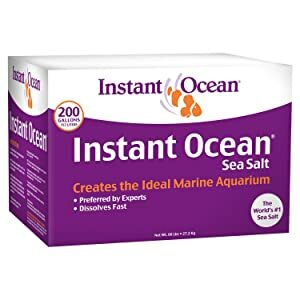 Salt mix – I strongly recommend Instant Ocean Sea Salt that includes major and minor trace elements necessary for a healthy saltwater aquarium. 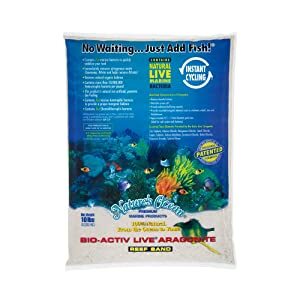 Mix every 1.5 lbs of this substrate with purified water to achieve 5 gallon saltwater with a specific gravity of 1.022 for aquarium uses. If you use other salt mix products, follow the instruction from the manufacturers. Add 6 x 1.5 lbs = 9 lbs Instant Ocean to the storage. Fill the storage with purified water to reach 30 gallons. Stir until the salt completely dissolves in the water. 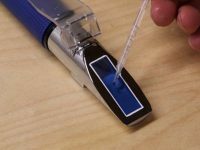 Use a refractometer to retest the specific gravity (indicate for salinity) of the mixed water. Ensure it is in the range between 1.019 and 1.025 ppt (*) that saltwater fish and corals require. If the specific gravity is out of the required range, add a little more salt if it is under 1.019, add more water it above 1.025. (*) This range depends on your fish and corals, so make sure to consult an expert or do some research on your particular fish to find out which specific gravity they require. Now, you can fill your tank just to where it starts flowing into the overflow. Add enough additional water to fill the sump to about three-fourths of its maximum depth. You will need a good aquarium heater and thermometer, even in summer months. Ideally, both should go in the sump out of view. The heater should be in an area with good water movement and the thermometer should be far from the heater and away from any heat sources or strong light sources like the sun. The heater should be approximately 4-5 watts per gallon. Once the system is setup, you will need to adjust the heater(s) to maintain a temperature of 76 to 80 degrees for virtually any marine setup. 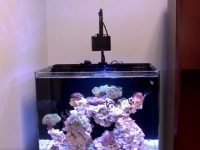 You will need an LED light for reef tank. A Current USA Orbit Marine fixture is a common choice because it supports fish, inverts, live rocks, and most beginner corals (soft/LPS) that are everything a beginner want to keep in his/her first saltwater aquarium. 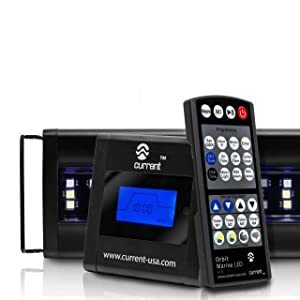 Moreover, the light comes with an intelligent timer controller that offers an automatic lighting cycle with sunrise and sunset for free hand control. 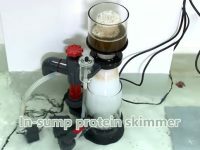 Protein skimmer – If you already have a protein skimmer get it up and running within the first few days. It may not produce foam at first, but if the rock is uncured or was cured and then shipped dry, the skimmer will get a good workout. Other equipment such as wave markers, UV sterilizers… may be added later if you want to keep demanding corals in your tank. GFCI breaker – Get a Ground Fault Circuit Interrupt breaker installed or buy one of the small, inexpensive extension cords with a GFCI breaker built in. Plug all your equipment through this outlet, using more than one if necessary. This device could save your life as it will turn off the electrical current if you ever break a cord or heater in the water. 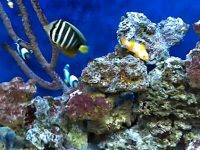 For saltwater aquariums, dead microorganisms from live rock and live sand are the first source of ammonia and you don’t need to supply an external source. If you do not initially get ammonia readings, try either adding a piece of uncured live rock or remove a less attractive piece of the cured rock and leave it in a dry bucket overnight. Then return it to the tank. (Do not do this with livestock in the tank). Either of these methods will jumpstart the process. Now add nothing during a month, but test ammonia, nitrite and nitrate levels (preferably daily). 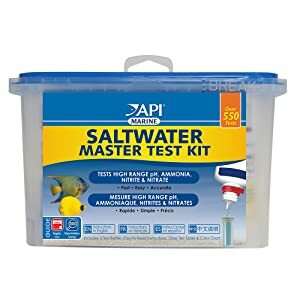 I recommend the API Saltwater Master Test Kits – a complete kit for testing ammonia, nitrite, nitrate, and pH in saltwater aquarium. Ammonia will spike first. Do not be surprised if it exceeds several parts per million. Since the tank has no livestock, this is not a problem and is a normal part of the process. When ammonia starts dropping, nitrite will climb. When it starts dropping, nitrate will climb. Do not be surprised if your tank does not perfectly follow this pattern. When ammonia and nitrite hit zero and nitrates are present, your tank is cycled (ie safe for hardy fish). A word or two about cycled and mature tanks is in order here. A cycled tank is not a mature tank. 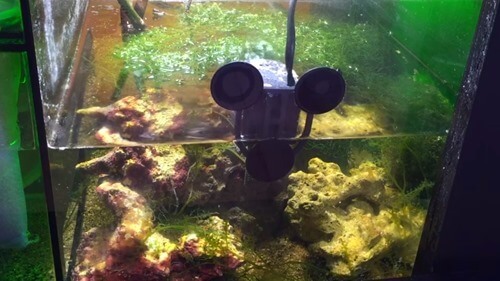 It merely means that the tank has experienced an ammonia/nitrite spike and enough nitrifying bacteria have multiplied to consume the ammonia and nitrite and reach a state of equilibrium with whatever processes in the tank are producing ammonia. Keep in mind that these processes still may be relatively minor. Every time you add a new animal to the tank, the tank essentially must cycle again. The ammonia output increases and the bacteria must reproduce to meet the increased demand and return to equilibrium. In a mature tank, this process can be completed in hours. In a newly-cycled tank, it will take longer, possibly days or weeks. If you read your test kits, see zero ammonia and nitrite and celebrate by rushing out and buying three trigger fish, an angelfish and a pufferfish, you will regret it. Your cycled, but immature tank will experience a large and potentially fatal ammonia/nitrite spike, not to mention the possible incompatibility among the fish and the almost-certain demise of most angelfish in new tanks. To put it bluntly, you should not buy a lot of fish right away. Read the discussion below on fish and reward your hard work in acquiring and setting up the tank with the patience to avoid sabotaging your own system. Poor fish selection and impatience are undoubtedly the cause of more frustrated hobbyists and dead fish than all the equipment problems, poor setups and poorly captured fish combined. All too often, a new hobbyist buys a fish on impulse. It is understandable given the beauty of a well-stocked tank. Do resist the urge to buy fish on impulse. Stick to one rule of thumb – if you were not specifically looking for it when you walked in, do not buy it. You should prepare a carefully selected stock list, run it by several experienced aquarists who have nothing to sell you, decide upon the best order of introduction (generally smaller and less aggressive fish before larger and more aggressive fish), make sure all of the fish are hardy, and then add no more than one every two or three weeks. Good fish for a newly-cycled tank are: pufferfish, triggerfish, damsels, groupers, moray eels, lionfish, the hardier wrasses, pseudochromis or dottybacks, chromises, clownfish and some of the hardier gobies. Unfortunately, most of these tend to be very aggressive. 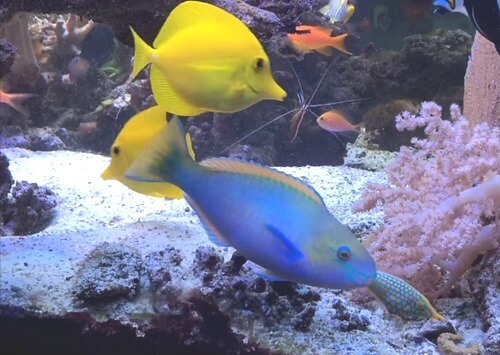 Good fish for a tank that has been successful and disease free for several months after cycling include: tangs (with some notable exceptions), cardinalfish, wrasses, grammas, gobies, blennies, very hardy angelfish, jawfish and filefish. Good fish families for a mature tank (older than six months) include: angelfish (with notable exceptions), some butterflyfish (many of this family should never be kept in captivity), anthias, mandarins, more delicate tangs and the more delicate fairy wrasses. Several fish deserve special mention because of dangers we pose to them or they to us: lionfish, coral cats, foxfaces, stonefish, scorpionfish and leaffish all have venomous spikes and can cause very painful and prolonged injuries if mishandled. Stonefish and scorpionfish can even be fatal. Pufferfish and boxfish are poisonous if eaten (by you or their tankmates) and can also release toxins in their shipping bag or the tank if stressed. Adding corals if you want a reef aquarium. When all is set and the tank has been healthy and stable for at least 3-4 months, it is time to consider coral selection.